While searching for Star Wars Rebels’ main IMDb page, I came across the entries for the first two episodes of the series. As always, IMDb is not a reliable source. 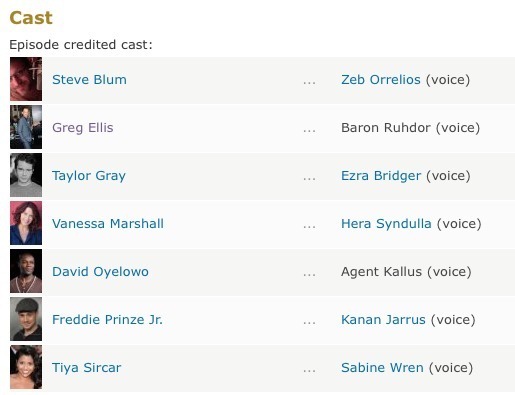 Notice the additional character called “Baron Ruhdor” played by Greg Ellis (24, Pirates of the Caribbean). As far as we know, this character doesn’t appear to be in the first two episodes. Nevertheless, he’s listed there. Once again, IMDb is not a reliable source of information given the fact that anyone can change it.